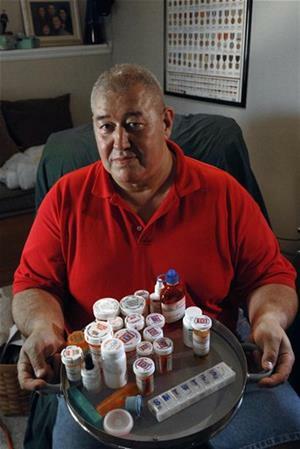 Many veterans might be familiar with the term “Gulf War syndrome.” However, the U.S. Department of Veterans Affairs now uses the term “medically unexplained chronic multi-symptom illnesses.” The VA recognizes that irritable bowel syndrome may have been a direct result of service on active duty during the Gulf War. As many as 20% veterans returning from active duty, with no prior IBS-related symptoms, may develop IBS. Numerous studies investigating Gulf War veterans have found that many fulfilled the diagnostic criteria for irritable bowel syndrome, as well as depression, anxiety, chronic fatigue syndrome, and multiple chemical sensitivity. See: Gulf War syndrome: an emerging threat or a piece of history? What is irritable bowel syndrome (IBS)? It is a common condition that can affect the normal function of the large intestine. IBS is the most common functional gastrointestinal disorder with worldwide prevalence rates ranging from 9 to 23 percent. IBS is characterized by a group of symptoms which include abdominal pain, bloating, constipation, and diarrhea. IBS is common among the civilian population, and also has been diagnosed in the combat veteran population. IBS may cause discomfort, but it does not permanently harm the intestines and does not lead to intestinal bleeding. IBS also does not cause inflammatory changes or increase your risk of cancer as ulcerative colitis and Crohn’s disease do. The research on post-infectious IBS may explain why many veterans are returning from service with IBS. The risk of IBS is heightened in individuals who experienced higher levels of anxiety, particularly in conjunction with stressful life events. The stressors inherent in military service such as traumatic combat experiences, ongoing fear of being harmed, and being far from home may be contributing to the increased risk of developing IBS. Scientists have not identified a singular cause for IBS and other functional GI disorders. Here is a list of most common causes of IBS that would specifically relate military personnel in an active combat environment. Low Stomach Acid: Hypochlorhydria or achlorhydria are cases in which the stomach doesn’t produce enough acid in response to the food eaten. Small Intestinal Bacterial Overgrowth (SIBO): Is an overgrowth of bacteria in the small intestine. Intestinal Dysbiosis: a condition in which the gut flora is disrupted. Celiac Disease: Is an autoimmune condition in which the villi of the small intestine get flattened/destroyed causing reoccurring diarrhea, loose stools, and many other non-GI health problems. Inflammatory Bowel Diseases (IBD). The two main inflammatory bowel diseases are Crohn’s and Ulcerative Colitis. All of the above are both causes of IBS as well as being their own unique condition. Each, by itself, may not cause IBS and may be manageable with minor dietary changes, and without medical intervention. When exacerbated, left unchecked, or combined with other co-factors, IBS or IBD may develop. All of the above causes and conditions can be created or exacerbated by the chronic stressors a soldier faces in combat or deployment to a combat zone. Antibiotics – Extended or repeated use, for any reason, can lower the total number of bacteria and lower the number of bacteria species that live in a normal healthy digestive tract. Physical Stress – Over training or aggressively moving through a combat can create an environment in which the tissues of your intestines overheat. This can lead to inflammation and irritation of the gut. Exposure to pathogens (Traveler’s Diarrhea) – Current recent research has shown that just one experience with Traveler’s Diarrhea can significantly change your gut flora leading to the development of SIBO and/or gut dysbiosis. This can potentially be exacerbated by antibiotics given to treat the TD. Bacteria – Bacteria are the most common cause of TD – 80-90%. Overall, the most common pathogen is enterotoxigenic Escherichia coli, followed by Campylobacter jejuni,Shigella spp., and Salmonella spp.